One of Riley’s absolute favorite cereals are Fruity Pebbles. I have a slight confession that it’s one of my favorites too. What’s not to love? The colors scream Spring, as you’ve seen in my Rainbow Yogurt Parfait that I also used them in. I originally thought I would use them in a cupcake, but realized that I hadn’t used my mini bundt pan since my Peppermint Mini Bundt Cakes. 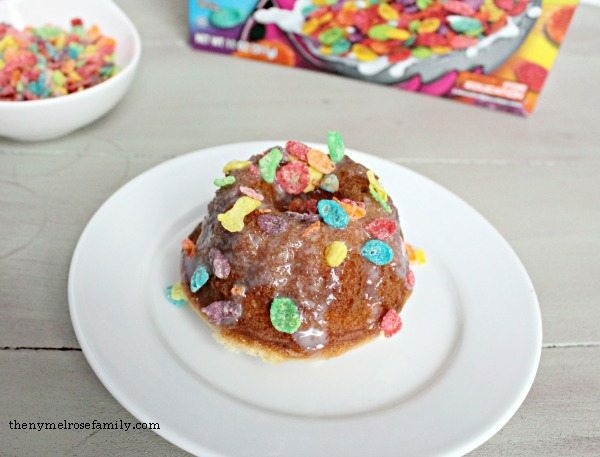 We settled on Fruity Pebbles Mini Bundt Cakes and Riley was thrilled with the outcome. 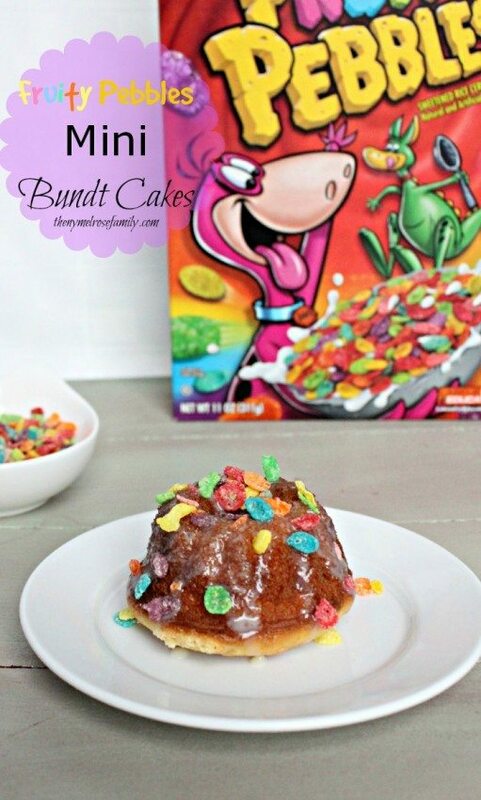 These bundt cakes are so simple to make and Riley loved dumping her rainbow into the batter. Plus, for the white chocolate lover, they’re drizzled with white chocolate ganache. So delicious! I have a thing for White Chocolate Ganache as you might remember from my Battenberg Cake with White Chocolate Ganache. I always seem to struggle with the consistency of the ganache. I think it’s because I’m just so impatient. I don’t like to wait for it to get to the consistency that I want. Plus, Riley’s incessant “Are they done yet?” makes it difficult to wait as well. We go through about a box of Fruity Pebbles in about 3 days with Riley eating them for breakfast. Luckily, right now Fruity Pebbles and other Post Cereals are on sale at Walgreens for $1.99 and are on sale until April 5th. I took advantage of this deal and stocked up since it seems to be our go-to ingredient right now. These bundt cakes are so easy to make since they’re semi-homemade! I used Betty Crocker Super Moist Yellow Cake Mix and added a cup of Fruity Pebbles into the batter. So easy! Riley helped throughout the entire process and loved mixing in the Fruity Pebbles. I think she liked it so much because it was necessary for her to go extra slow in order to “dunk” the cereal into the batter. Once the cakes are cooled drizzle them with White Chocolate Ganache or your favorite topping. 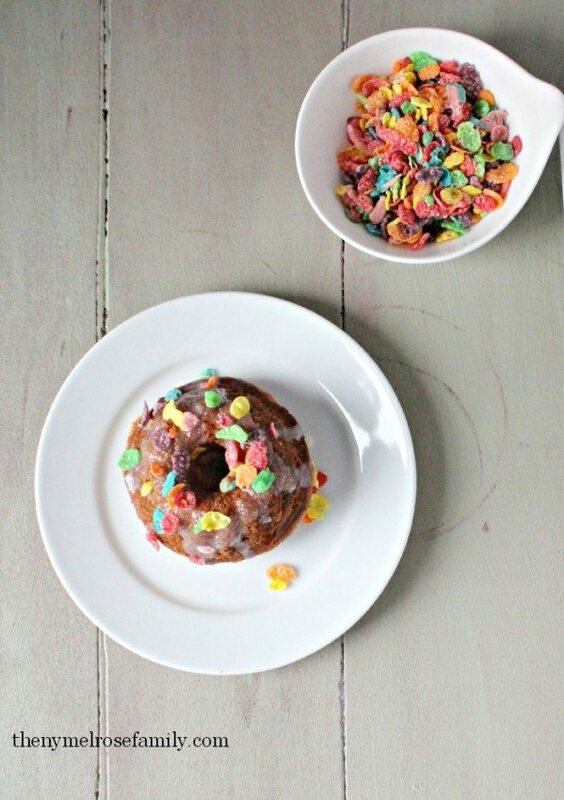 The finishing touch is sprinkling them with Fruity Pebbles. These mini bundt cakes are delicious and are the perfect Spring dessert! 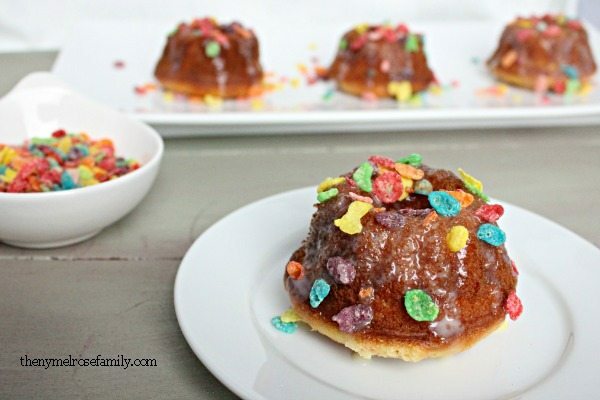 These Fruity Pebbles Mini Bundt Cakes are the perfect Spring dessert. Preheat the oven to 350 F and spray a mini bundt tray with baking spray. Prepare the Betty Crocker Cake Mix according to package instruction and then hand mix in a cup of Fruity Pebbles Cereal. Pour the batter into the bundt cake tray. Was looking for a recipe for my niece’s upcoming birthday… so glad I stumbled across these cute cakes!